(Nanowerk News) Researchers at DESY have used high-speed photography to film one of the candidates for the magnetic data storage devices of the future in action. The film was taken using an X-ray microscope and shows magnetic vortices being formed in ultrafast memory cells. 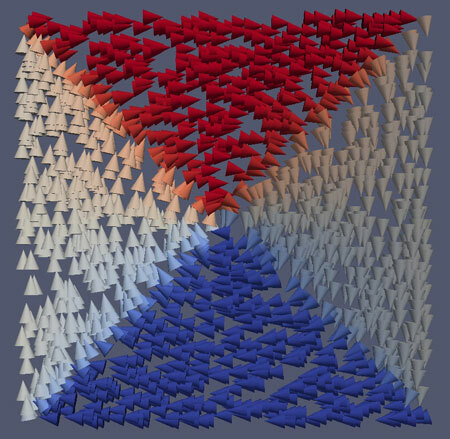 Their work, which has been reported by the scientists surrounding Dr. Philipp Wessels of the University of Hamburg in the journal Physical Review B ("Time-resolved imaging of domain pattern destruction and recovery via nonequilibrium magnetization states"), provides a better understanding of the dynamics of magnetic storage materials. Magnetic memory cells are found in every computer hard drive. “Our images allow us to observe in real time how exactly magnetisation evolves”, explains Wessels, from the research group of Prof. Markus Drescher at the Hamburg Centre for Ultrafast Imaging (CUI). “For the first time, we can observe the switching of these magnetic cells in detail." For their investigation, the researchers chose a memory cell made of an alloy of nickel and iron, which can be magnetised in less than a billionth of a second. Their custom-built X-ray microscope, developed in association with a group headed by Prof. Thomas Wilhein at the Koblenz University of Applied Sciences, makes it possible for scientists to watch a memory cell being erased and then having new data written into it. The short pulses of X-rays produced by DESY’s synchrotron radiation source PETRA III give the images a temporal resolution of 0.2 billionths of a second (200 picoseconds). 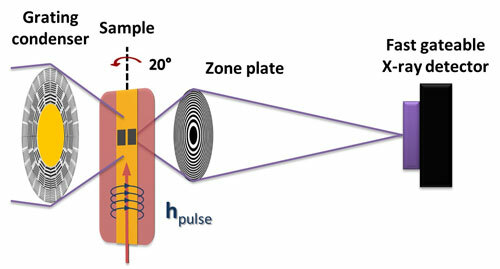 The degree of magnetisation can be measured via the extent to which the polarised X-ray radiation is absorbed by different regions of the sample. The X-ray microscope is able to distinguish minute details, down to 60 millionths of a millimetre (60 nanometres). In their experiment, the scientists used tiny squares of the nickel-iron alloy, each side of which was two thousandths of a millimetre (2 micrometres) long. Each of the memory cells has four magnetic regions, so-called domains, whose magnetic field varies either in a clockwise or anti-clockwise direction. The individual magnetic domains are triangular, with their apexes meeting in the centre of the storage cell, producing a magnetic vortex core in the centre of the cell. The external magnetic field forces the entire memory cell into a state of uniform magnetisation. Once the field is switched off, the cell once again forms four magnetic domains with a central vortex – whose direction depends on that of the applied magnetic field; in other words, new data is written to the cell. The process is complex, however. “The four-domain state develops via a complicated zigzag pattern, and for the first time we were able to watch ‘live’ as this state was formed”, reports Wessels. The observed behaviour is in good agreement with the results of simulations. Thanks to the super-slow motion film, the high-speed dynamics of the process can now be viewed in greater detail. These investigations have considerable practical implications for data storage technology. “Although laptops and other mobile devices these days are increasingly using non-magnetic storage technologies, such as flash memory, the price of magnetic data storage devices means that there is no substitute for them when it comes to storing large amounts of data”, says Wessels. “The current trend is towards storing data in the cloud – and the cloud is magnetic.” A better understanding of magnetisation dynamics can lead to faster and better storage media.